• What are the Uses of Omeprazole? • What is its Mechanism of Action? • How Should Omeprazole Be Used? • What Is the Dosage of Omeprazole? • What Are the Brand Names for Omeprazole? • What to Do If I Miss a Dose? • How to Store and Dispose of This Medicine? • What are the Side Effects of Omeprazole? • What Are the Drug Interactions? • What are the Symptoms of Overdose? Omeprazole belongs to the proton pump inhibitors group of drugs. It works by decreasing stomach acid because of which, it is used in conditions like gastroesophageal reflux disease (GERD), indigestion, and stomach ulcers caused by bacteria Helicobacter pylori. It relieves symptoms caused by an increase in stomach acids like heartburn, abdominal pain, and a group of patients with persistent cough due to acid reflux. It is available in liquid and capsule form. What are the Uses of Omeprazole? Gastroesophageal reflux disease (GERD) - The acid in the stomach flows (reflux) back in the esophagus (tube connecting the mouth and stomach), usually causing a tear and sometimes ulcers in the food pipe (esophagus). Zollinger-Ellison syndrome - A rare condition where gastrin (a gut hormone) causes small tumors to form in the pancreas and/or duodenum (upper part of small intestine). These tumors produce large quantities of acids causing stomach, duodenal, and sometimes jejunal ulcers often together with symptoms of diarrhea. Barrett's esophagus- A condition in the esophagus due to prolonged reflux of acid content into the food pipe from the stomach. In this condition, Omeprazole is used for the prevention of cancerous changes in the lining of the food pipe. H.pylori infection - Bacterial infection caused by Helicobacter pylori. Gastric and duodenal ulcers - Omeprazole is used in NSAID induced ulcers, and in combination with antibiotics is used to treat gastric and duodenal ulcers caused by H.pylori. Heartburn - Burning pain in the chest due to acidity is called heartburn. Prevents upper gastrointestinal tract bleeding - Duodenal (beginning part of small bowel) ulcers, stomach ulcers, and erosive gastritis are a few leading causes of upper gastrointestinal bleeding. Omeprazole is a selective, competitive, and irreversible proton pump inhibitor drug. It works by suppressing the production of stomach acid. It inhibits the gastric parietal cells found in the lining of the stomach from producing acid. It starts working within 1 hour of oral administration and is highly effective in the next 4 hours. The duration of its action lasts usually for 24 to 48 hours but may last about 72 hours. How Should Omeprazole Be Used? Omeprazole is available as 10 mg, 20 mg, and 40 mg of delayed-release capsule and 2.5 mg or 10 mg of delayed-release granules (to be mixed with water). A liquid form is also available. It should be taken at least 30 minutes before a meal, preferably before breakfast. It is either taken ones or twice a day depending on your condition and doctor’s prescription. Follow your doctor’s instructions or read the package label carefully before taking this medicine. If you are taking the delayed-release capsule, swallow the capsule as a whole with water. Do not chew, crush, or break the capsule. If you are using the granules, then mix the 2.5 mg sachet with 5 ml water or 10 mg sachet with 15 ml of water and drink. It takes 1 to 4 days for the drug to produce an optimum effect, so it is not used for immediate relief. Do not take it for more than 4 months continuously without consulting your doctor. It is not advisable to stop or start taking Omeprazole without medical supervision. What is the Dosage of Omeprazole? The dosage differs for different patients and conditions. Always take medicines under medical supervision, it is never a good idea to self-medicate. The drug might have interactions that you might not be aware of. For peptic ulcer - 20 mg or 40 mg once or twice a day before a meal as per your doctor’s prescription. I am having heartburn for past four months. What can be done? For GERD - 20 mg once or twice a day as per your doctor’s prescription, before a meal for up to 8 weeks. For Zollinger-Ellison syndrome - 60 mg once or twice a day as per your doctor’s prescription, before a meal. What Are the Brand Names for Omeprazole? If you forget to take a dose, take it as soon as you remember. But if it is almost time for your next dose, then just skip the missed dose and continue with your normal schedule. Do not take two doses at a time. How to Store and Dispose of This Medicine? It should be stored at room temperature in a closed container. It should be kept away from heat, cold, and moisture. Dispose of outdated or expired medicines. Do not flush this medicine. It is best you dispose of expired medicine through medicine take-back program. Keep all medicines away from children. Swelling of the face, throat, ankles, etc. Blood in urine and decreased urine. If you notice any of these side effects, get medical attention immediately. Antifungals like Itraconazole, Ketoconazole, and Posaconazole. Antiplatelets like Clopidogrel and Warfarin. Always take any medicines including herbal and other supplements after consulting your doctor. If your doctor has prescribed you Omeprazole, then inform him or her if you are taking any of the above drugs. Do not take this if you are allergic to it, as it causes severe allergic reactions. Taking Omeprazole for more than 4 months might inhibit vitamin B12 absorption and cause vitamin B12 deficiency. This medicine increases the chances of hip, wrist, and spine fracture for older patients due to a decrease in the absorption of calcium. Taking this medicine for more than a year might cause low magnesium in the blood. Long term treatment of this medicine may cause iron deficiency due to impaired absorption. Long term treatment with Omeprazole increases the risk of Clostridium Difficile infection of the colon and other gut infections. In patients with decompensated cirrhosis, prolonged therapy increases the risk of spontaneous bacterial peritonitis. Long term use might also increase the risk for fundal gland polyp, which is a noncancerous (benign) tissue growth in the upper part of the stomach. Patients with liver diseases should inform your doctor before taking this medicine. Get immediate medical attention if you develop any overdose symptom. 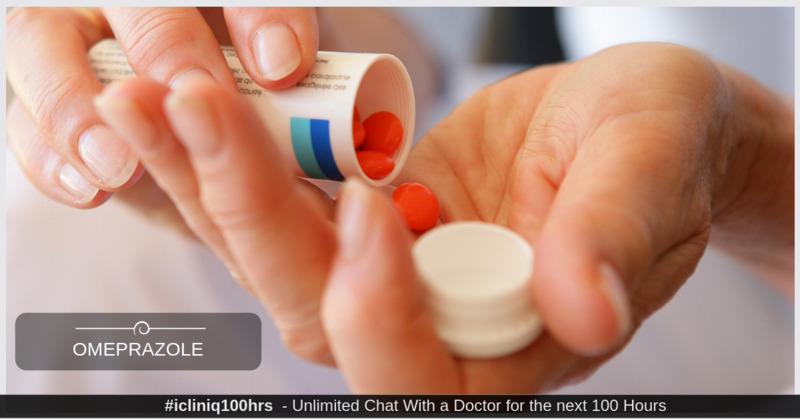 Do you have a question on Omeprazole or Gerd?